This page gives some details on the nasa.gov DNSSEC outage from August 14 to 15, 2015. It lasted over 4 hours. From the variety of DNSSEC failure types in logs, and the multiple different kinds of failures shown in DNSViz and the DNSSEC Debugger, it appears the NASA DNS administrators solved the DNSSEC outage by trying random things until one of them finally worked. OpenDNS does not support DNSSEC, instead supporting DNSCurve. Google Public DNS currently supports only DNSSEC, and thus, Google's users saw SERVFAIL for queries under nasa.gov during this outage. www.nasa.gov. 489 IN CNAME www.nasawestprime.com. www.nasawestprime.com. 11 IN CNAME iznasa.hs.llnwd.net. 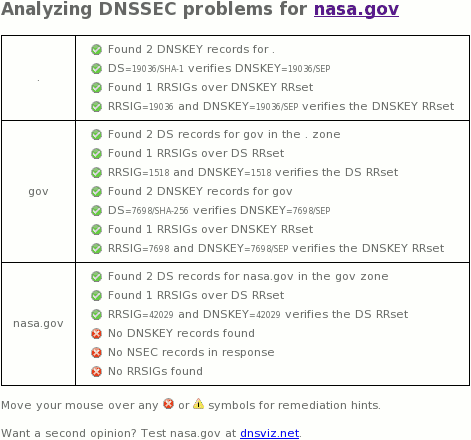 Zonemaster archived this nasa.gov DNSSEC outage here.